Most of the vehicles available for review show so few miles on the odometer that it’s difficult to envision problems that might develop down the road. This Touareg, however, arrived so late in the 2013 model year that it was already showing more than 10,000 miles of accrued travel. The benefit of driving such a relatively high mileage test vehicle is that it allows you to judge how well it wears its mileage. In the case of this VW, you could never tell it had travelled more than ten thousand miles if you didn’t sneak a peek at the odometer. The ingot like chassis had not developed so much as a single squeak. The massive doors still shut with the authoritative click you expect from a Zippo lighter cap. Lovely 5-spoke alloy wheels showed nary a curb scar thanks to the protective shielding afforded by the bulging sidewalls of the Michelin GreenX radials (265/50R19). Unlike so many car chassis based crossover SUVs, the Touareg feels more like a truck than a car. For starters, you step up into the spacious cabin, which, by virtue of its height, affords you a commanding view of the road and traffic patterns. This visual superiority trumps any information conveyed by the lane departure warning systems that are all the rage today. Our test Touareg was not equipped with any of these annoying contrivances, nor did it need them thanks to the excellent 360 degree vision available from the driver’s seat. Touareg’s truck-like attributes also manifest themselves in the 7,700 pound tow capacity of this chassis. Although you can’t quite fold the 40/20/40 split rear seats flat, you can still gain 64 cubic feet of storage by tilting them forward. 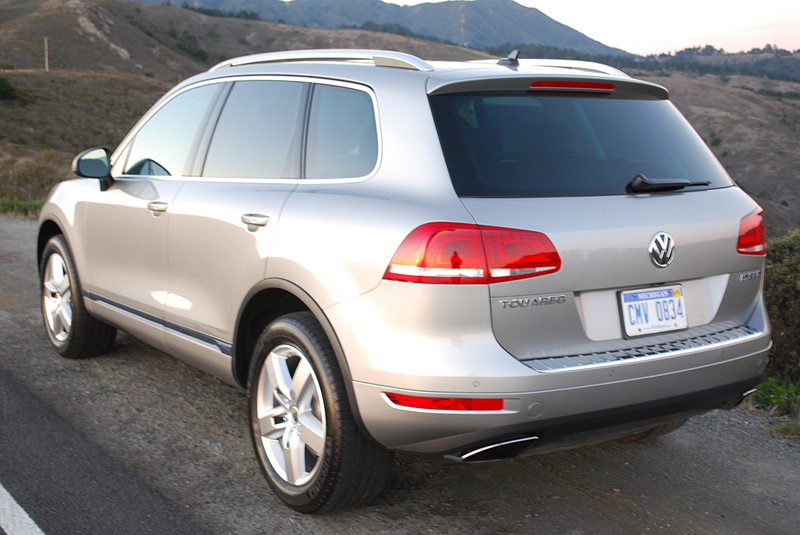 With rear seats erect, the Touareg still provides 34 cubic feet of space in its sizeable aft compartment. The key fob allows you to open the aft hatch, and a button near the liftgate lets you automatically shuts the lid. VW only offers the Hybrid power train in its top model Touareg. At a base price of $62,575, you’re not wanting for anything in the comfort or luxury department. Beautifully upholstered front leather seats feature 12 way adjustability and 3 stage heating. The steering wheel is heated, as are the outboard rear seats. Deep door pockets, a vast glove box, and sizeable center console and dash face compartments all help keep clutter under control. Each front seat commands no less than 3 memory positions for favored seat position. Standard fitment on the Hybrid is an RNS 850 touch screen navigation and radio control panel. This graphic interface also provides rear vision when reverse gear is engaged. An enormous power sunroof remains eerily quiet even when open at freeway speeds. Bi-Xenon headlights swivel to illuminate turns at night. Standard Climatronic heat and air conditioning reacts swiftly to input changes and effectively distributes air on demand to individual tastes on separate sides of the cabin. If you get the idea that this Touareg is just about enjoying an elevated level of indolence, you’re missing the point. What this VW really has in spades is power, lots of power. 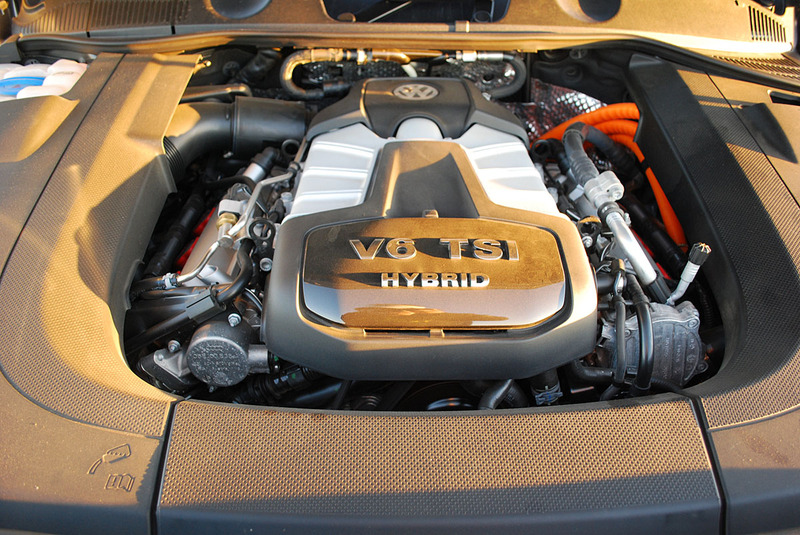 For starters, this is the world’s first supercharged Hybrid. A 333hp supercharged V6 combines with the added 47hp kick of an electric motor to produce 380hp and a whopping 428 pound feet of torque. When you slam the right pedal home, the Hybrid hurls its 5,000 pound curb weight forward like a Tim Lincecum fastball. Aided by an 8-speed automatic transmission, the Hybrid Touareg is never lacking for grunt. The only fly in the ointment is getting the ferociously fast rig stopped. Unfortunately, the regenerative brakes on our test vehicle felt spooky and inconsistent. This seems to be the hallmark of hybrids which transfer brake heat into energy. 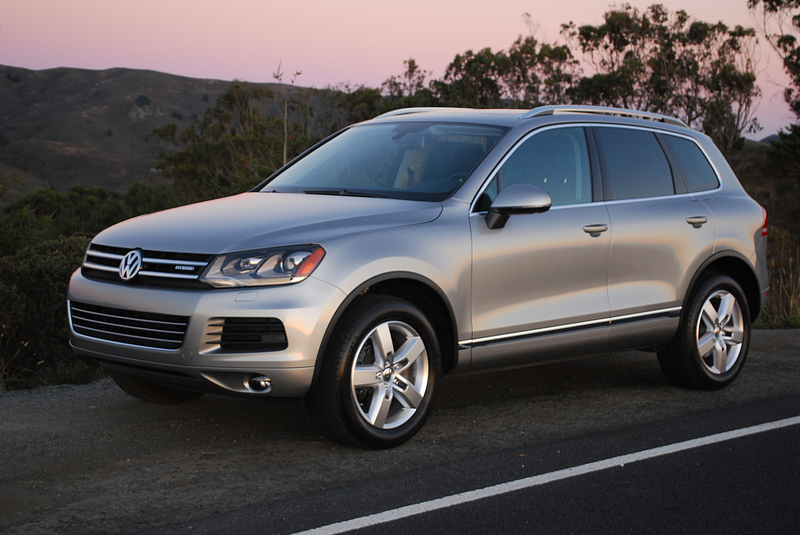 The Touareg Hybrid is a remarkably sporting proposition. Thanks to its Goliath twin engine power train, it will run circles around lightweight sports cars, while looking after your every need with palatial solicitude. It’s really quite a bizarre combination of attributes, well worth the lofty asking price.